Remember the New York City streetcar? Unless you’re a New Yorker of a certain age, you definitely don’t. Advances in transportation technology (what die-hard conspiracy theorists refer to as Great American Streetcar Scandal) drove streetcars all over the U.S. straight to the last stop. 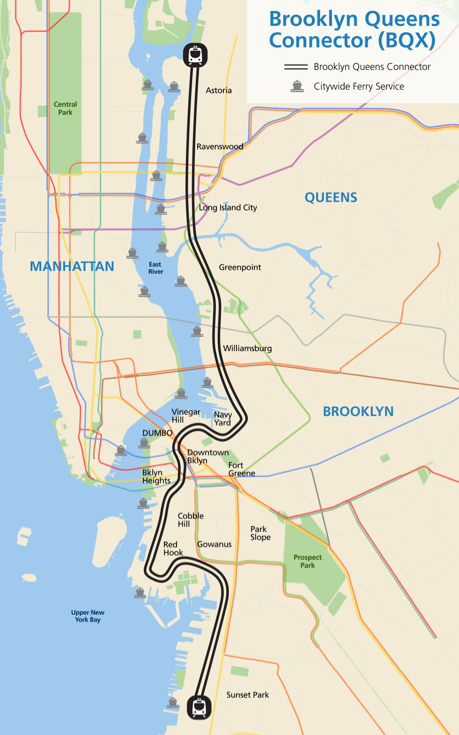 Yet, it’s now very possible that two neighboring boroughs, Brooklyn and Queens, will be reunited once again via a new streetcar line of their very own. 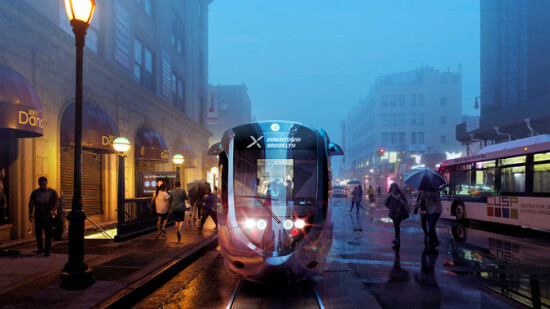 The streetcar plans legitimate what transportation planners (and Michael Kimmelman) have known for years: commuting patterns in the city have changed, and the hub-and-spoke model no longer serves diffuse, inter- outer-borough commuting patterns. 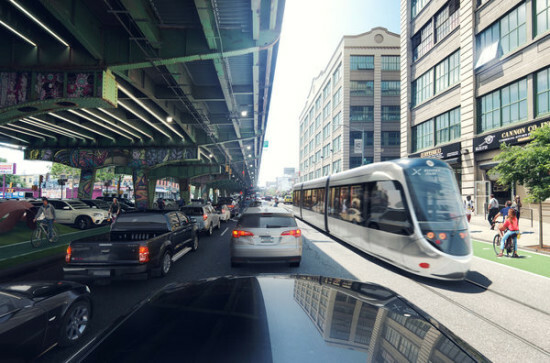 In his State of the City address last week, Mayor de Blasio proposed a 16-mile waterside streetcar route, the Brooklyn-Queens Connector (BQX), that would run through 14 neighborhoods, from Brooklyn’s Sunset Park through Astoria, Queens. These areas have seen swift transitions from their industrial origins and rapid population growth as the waterfront settles comfortably into its post-industrial future. Renderings are credited to a nonprofit called the Friends of the Brooklyn Queens Connector. According to The Daily News, members include “transit experts, community leaders and business giants like Doug Steiner of Steiner Studios, investor Fred Wilson of Union Square Ventures and Helena Durst of the Durst Organization real estate firm.” When the plan was announced in January, AN reached out the the nonprofit repeatedly for comment to confirm stakeholders and received no response. With backers like these, concerns about gentrification and potentially developer-driven policy have been raised. 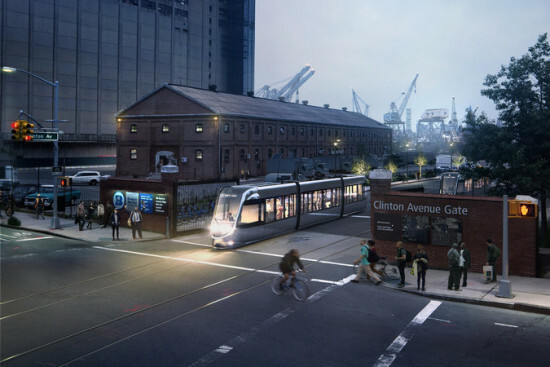 Some see the streetcar idea as a way to spur already-high land values along the waterfront, although the streetcar could also provide the more than 40,000 residents of waterfront NYCHA complexes with better access to public transportation. Others have raised concerns about locating the line in a flood zone. Still others have questioned why the city needs to spend billions on a new form of transportation, one that moves at a pokey 12 miles-per-hour, when bus service could be offered along a similar route. There is time to debate: Although energy around the plan is high, the groundbreaking is a long way off. The plan’s timeline states that construction is expected to begin in 2019, and service could begin in 2024. The city pegs the cost at around $2.5 billion, although earlier estimates ran $800 million lower.